Enter the chaos of war in For Honor® as a bold Knight, brutal Viking, or deadly Samurai. Are You a Knight, Viking, or Samurai? Enter the chaos of war in For Honor® as a bold Knight, brutal Viking, or deadly Samurai. Wield your blade like never before with the innovative Art of Battle combat system that puts you in total control of your warrior. Master the sword, and fight in brutal, fast-paced melee combat across an engaging story campaign and groundbreaking multiplayer modes. Since its launch in February 2017, For Honor has undergone continual updates and improvements. The addition of dedicated servers has provided a stable and seamless experience for players and new training modes give players the tools to go from apprentice to master while earning rewards. Take your newfound skills to brand-new modes and customize your heroes with thousands of gear items added since launch. The new Marching Fire™ update is now live and includes a brand-new faction with instant access to four new heroes, a new PvP mode, unlimited PvE content, and a comprehensive graphical update. Choose your favorite warrior among a variety of unique Heroes, from bold Knights, brutal Vikings, deadly Samurai, and vicious Wu Lin. Able to turn the tide of battle and make their faction victorious, each Hero comes with his or her own weapon set and combat style. Express your personality and inspire fear in your enemies by customizing each facet of your warrior, including your chest, shoulders, helmet, and weapon. After a great cataclysm, three of the fiercest warrior factions in history clash in an epic battle for survival. Whether you’re storming castles and fortresses, engaging in massive battles, or confronting deadly bosses in intense duels, you will need all your wits and skills to ensure the survival of your people and foil the plans of the merciless and bloodthirsty warlord Apollyon. For Honor’s biggest and most ambitious update ever is available now. With a new faction, four new heroes, and all-new game modes and features, Marching Fire will take your experience to the next level. Attack and defend a castle in Breach, For Honor’s new strategic 4v4 PvP mode. Available to all players with the Marching Fire update, Breach mode is a strategic, 4v4 PvP mode where players live the fantasy of storming or protecting a well-fortified castle equipped with ballistas, fire cauldrons, and archers. Arcade mode, exclusively available to Marching Fire Expansion or Edition owners, is a new solo or co-op mode where players fight battles and earn rewards that carry over to all multiplayer modes. Explore new Heroes and level them up before taking them into PvP. Offering infinite replayability, this quick play mode will deliver a new battle every time with varying objectives, enemies, and modifiers. Arcade will feature weekly events and challenges with exclusive rewards. Marching Fire also brings free graphical enhancements to the world of For Honor with updated and enriched textures, improved global illumination, and new sky and cloud technology. Further improvements include an updated user interface that will allow players to get into matches faster and a new Victory Celebration Screen. For Honor’s diverse multiplayer modes will test your skill and take your adrenaline to the next level. In the heart of battle with your band of warriors, coordination and communication will be the key to victory as you support your allies, slaughter enemies and own the battlefield. - The base game includes 12 Heroes, 7 multiplayer modes, a story campaign, and the new 4v4 Castle Siege Breach mode. 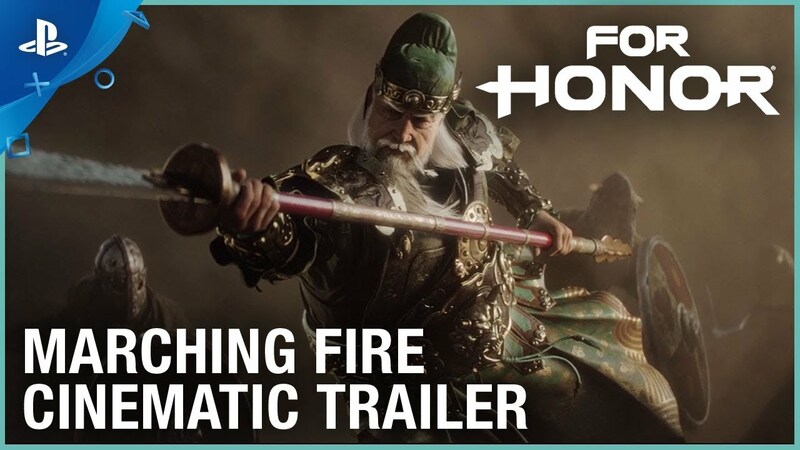 - The Marching Fire Expansion includes 4 new Heroes (Shaolin, Nuxia, Jiang Jun, and Tiandi) and the unlimited solo or co-op PvE Arcade mode. - The Year 3 Pass includes 4 new Heroes coming in 2019 (1 week early access) and 4 elite outfits (1 per new Hero). - The Year 1: Heroes Bundle includes 6 additional Heroes (Centurion, Shinobi, Gladiator, Highlander, Aramusha, and Shaman) and 6 elite outfits (1 per Hero).